The meta-joke here is that the four guys are played by somewhat washed-up movie stars seeking, ostensibly, to recapture a bit of their former fame. 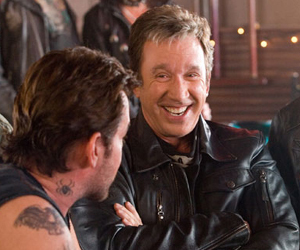 John Travolta, Tim Allen, Martin Lawrence, and William H. Macy, who seem just as out of place and uncomfortable in leather jackets and do-rags as one could imagine, do their best to act like lifelong buddies when it’s pretty clear they all just showed up to flash a grin and collect a paycheck. Nevertheless, they do form an entertaining bunch of buds, and Allen and Lawrence riff on each other with at least a shadow of the biting wit and sarcasm on which they built their careers more than a decade ago. Travolta must have thought he was filming Face/Off Part 2, as he spends most of the movie acting like an over-the-top Nicolas Cage. And that’s saying something. We are supposed to believe the Wild Hogs are a close-knit group of lifelong friends, but the chemistry just isn’t there. Instead they seem like a group of four guys who are getting paid to act as if they are lifelong friends. Oh, wait. "This one time on Home Improvement, Jill was mad at me so I got advice from Wilson. And then I made fun of Al's mom!" Once they shrug off the chains of women, kids, jobs, and escape from the seventh level of hades known in Hollywood as “marriage,” they find themselves careening down the highway without any worries, cares, or cell phones in order to recapture a bit of the good ol’ days. But sure enough, things get out of hand pretty quickly as they encounter overbearing policemen, tent fires, and a paint-by-numbers motorcycle gang called the Del Fuegos who does not suffer posers gladly. It’s too bad that the road trip has so many missed opportunities, as this type of setup is essentially a blank canvas for which to create any number of potentially funny situations. But rather than trying to be creative or interesting, the movie races straight to junior-high humor and stays there. We are treated to gags about bodily fluids, mishaps with wild animals, and a scene in which the guys decide to go skinny dipping in a hot spring only to be interrupted by (who else?) an unsuspecting vacationing family (oh the hilarity!). Of all the possibilities afforded by the road trip setup and the four talented actors on display here, we instead get poop jokes and gay cops. 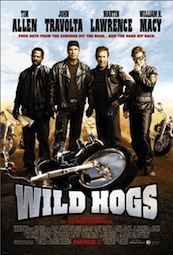 Something resembling a conflict enters the mix when the Wild Hogs set out to save a small town from the terrorizing throes of the Del Fuegos and their schoolyard bully leader Jack (Ray Liotta). 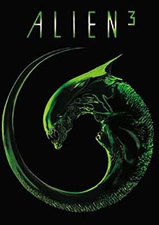 Dudley (William H. Macy) also finds himself a love interest named Maggie (Marisa Tomei) who runs the local diner and could sure use a biker in shining leather to save her from the mean Del Fuego men. 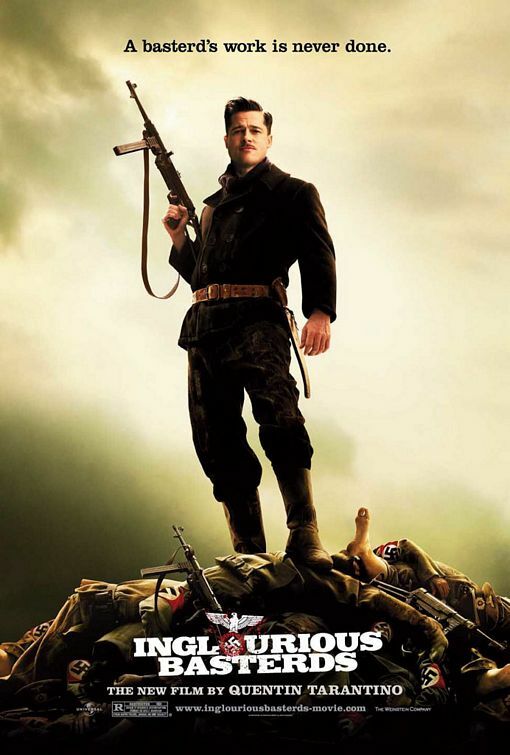 Like the rest of the movie, it’s a by-the-book setup that plays out exactly how you think it will, which is again kind of sad given the sheer number of missed opportunities to be truly creative. And despite good performances from Allen, Lawrence, and Liotta, there is very little here to recommend to anyone. “Glory Road” is a good illustration of just how hard it is for movies to do what sports do. They rarely do anything to challenge our views, but rather reinforce our comfort in what we already assume. Ironically, they have a habit of acting as if they are saying something revolutionary.